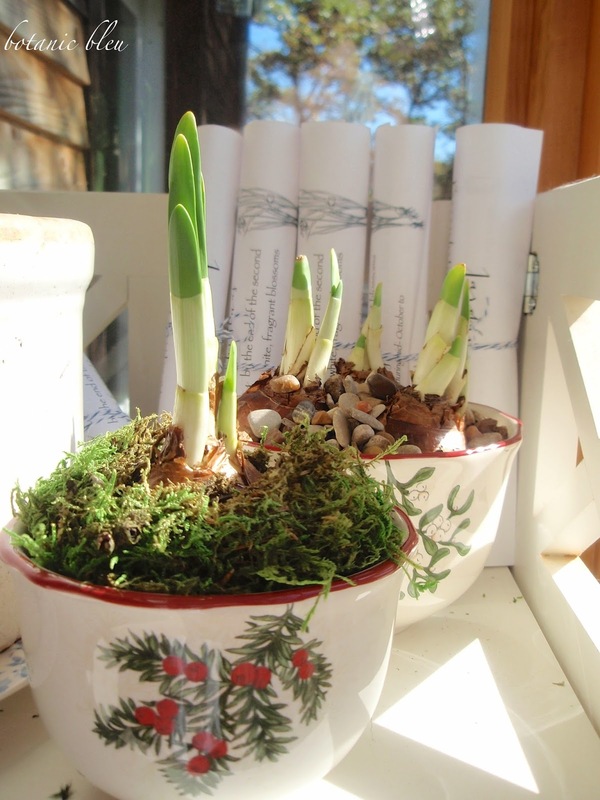 Planting paperwhite narcissi to force into early bloom in time for Christmas is a beautiful way to add fresh flowers for the holidays. All it takes is bulbs, some pebbles, water, a sunny location, and a container. 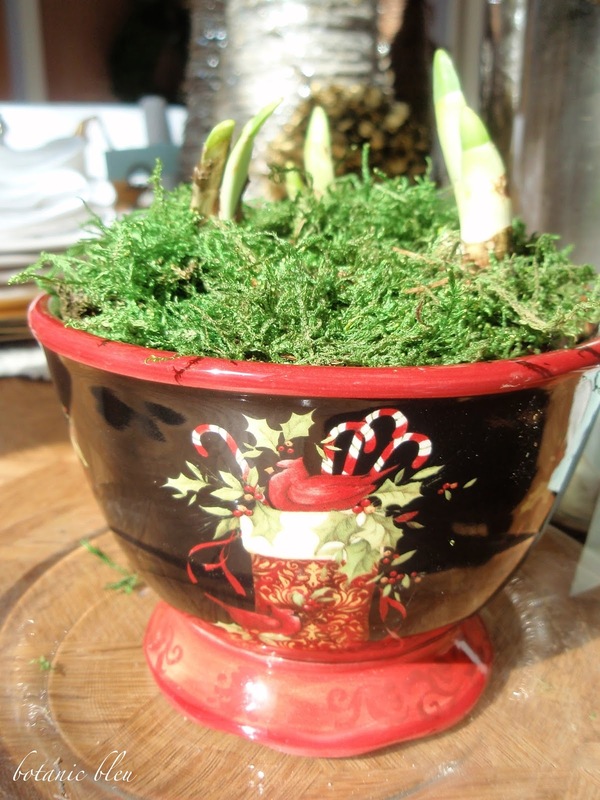 Even those with brown thumbs for growing plants are successful with Christmas narcissi. 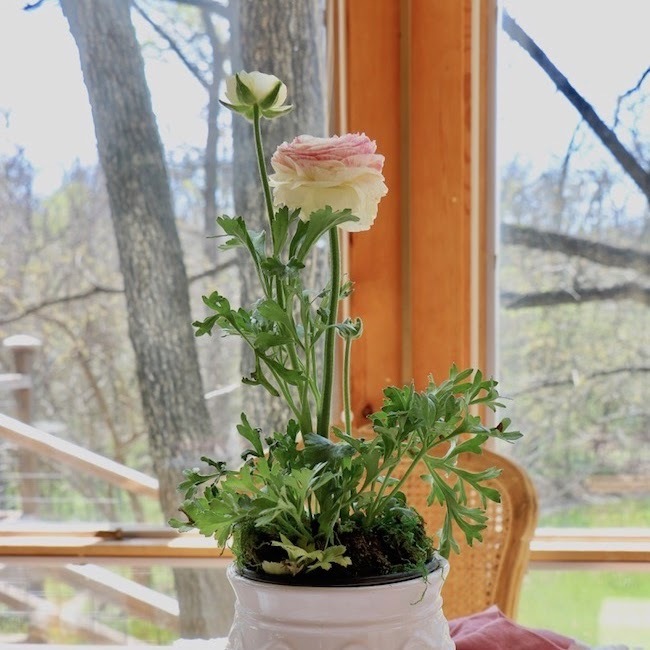 Containers can be anything watertight, from clear vases for flowers to porcelain soup bowls, to French zinc seed pots, to vintage ironstone crocks. Even boxes that have a water proof container insert are options for forcing paperwhite blooms inside. Watch for Christmas-patterned bowls of all sizes. 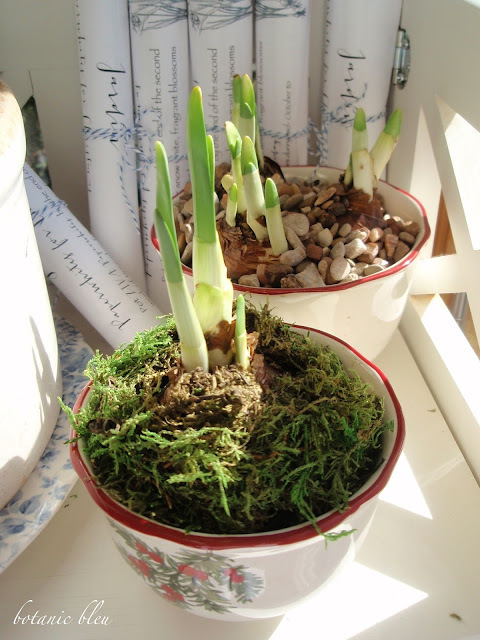 Plant one bulb in the smallest bowls, and plant 3-4 bulbs in soup bowls. 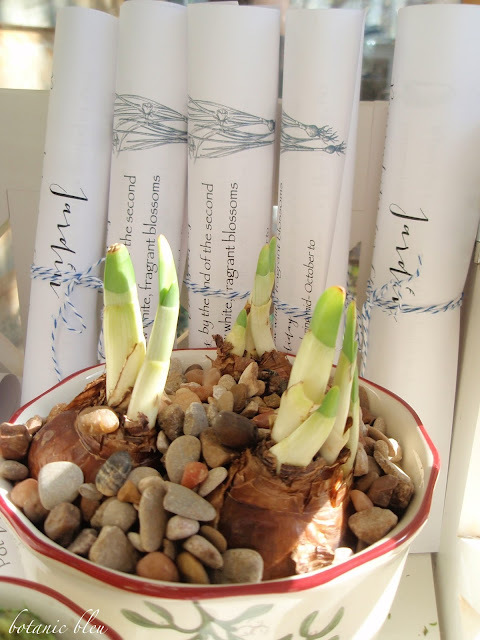 By using 17+ cm size bulbs, the bulbs will produce multiple stems and multiple blossoms. So even a small bowl planted with just one bulb can still look full. The key is to place the bulbs so that they touch one another. The soup bowl with pine cones has three large bulbs that touch one another. The vintage white stoneware crock has six bulbs. After anchoring the bulbs in pebbles and adding water just to the bottom of the bulbs, adding preserved moss dresses up the plants even more. 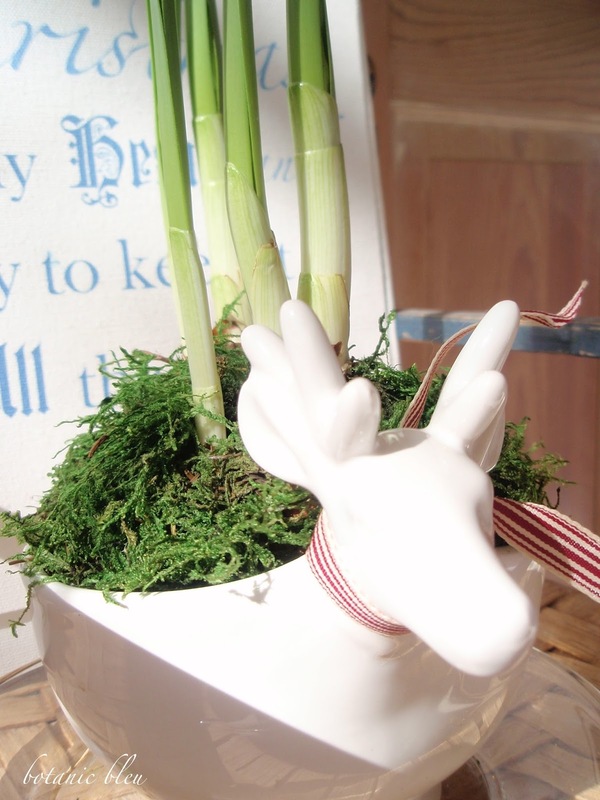 Paperwhites make beautiful hostess gifts that last for several weeks with minimal care. Print care instructions to include with them when giving as gifts. See Christmas Beautiful Ideas 2 - Paperwhites for a printable set of instructions. 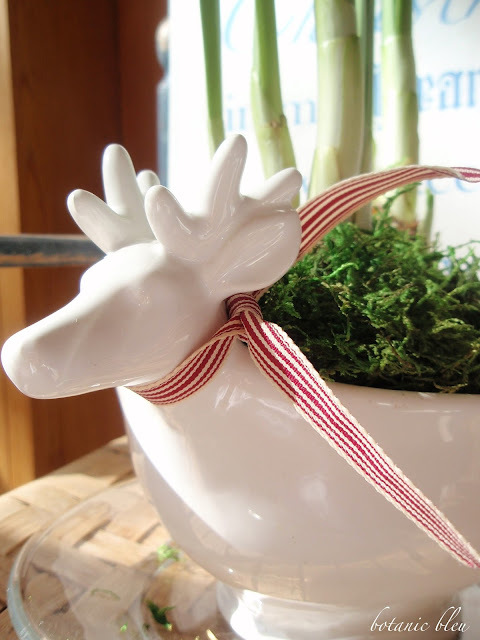 A soup-size white reindeer bowl is probably my favorite container this year. His red and white striped scarf (ribbon) adds Christmas's signature color and says, "Merry Christmas." 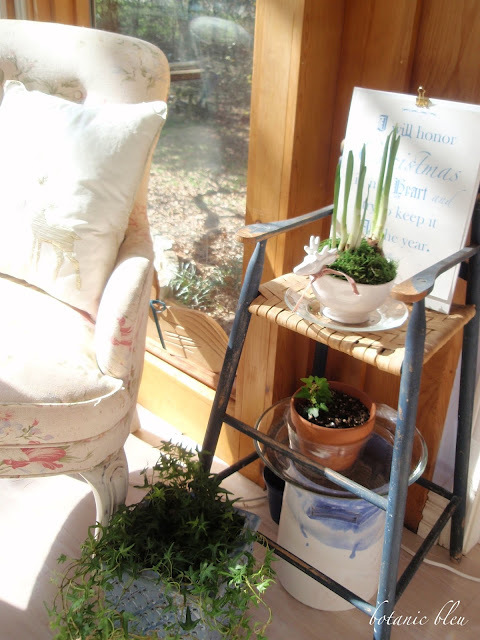 Place a clear salad plate underneath the potted narcissi to protect your furniture. Even if the bowl is watertight, the clear plate helps catch spills when adding water to the bulbs. Use pie plates and large platters under larger bowls. After the holidays, festive bright bowls can be reused as candy dishes, as well as their original purpose of serving soup. 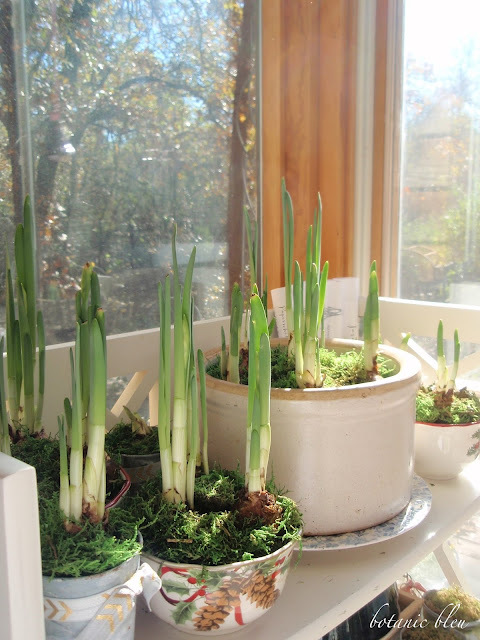 A bright, sunny warm space is best for growing the bulbs. 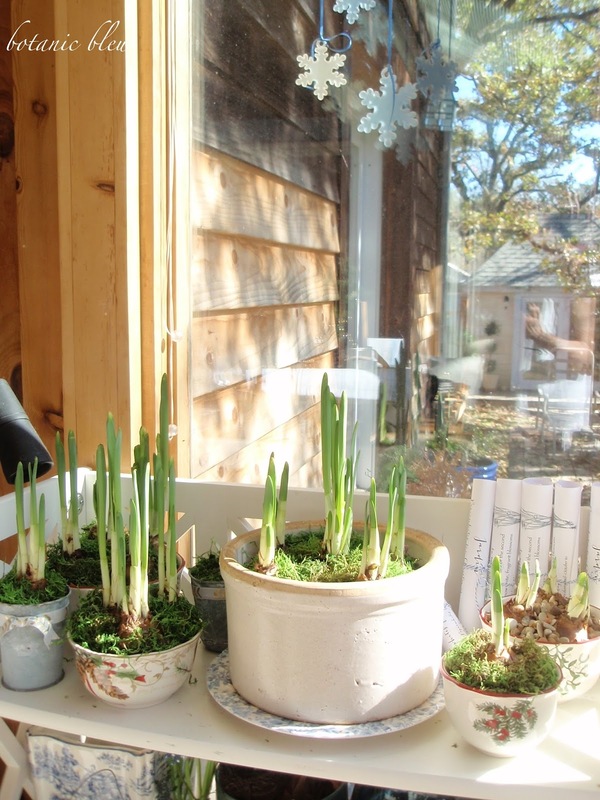 Once the bulbs begin to bloom, keeping them out of direct sunlight will prolong their blooming period. Cool temperatures also slow the bulbs' growth. Moving the paperwhites to the garage, provided the garage's temperature remains above freezing, at night is similar to florists keeping their flowers in a refrigerated cooler. Just one little pot of paperwhite narcissi adds a touch of Christmas. Even if you think you do not have a green thumb and have never had much luck with houseplants, try growing paperwhites. 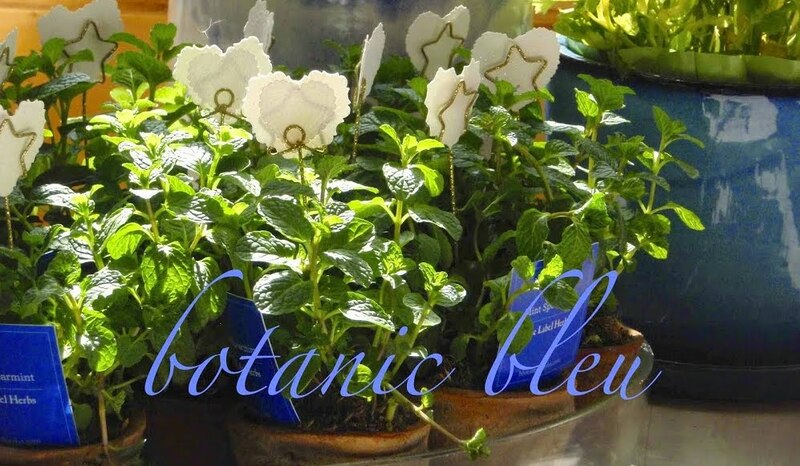 They can be quickly potted and are easy to maintain. Just keep the water level to the bottom of the bulb. 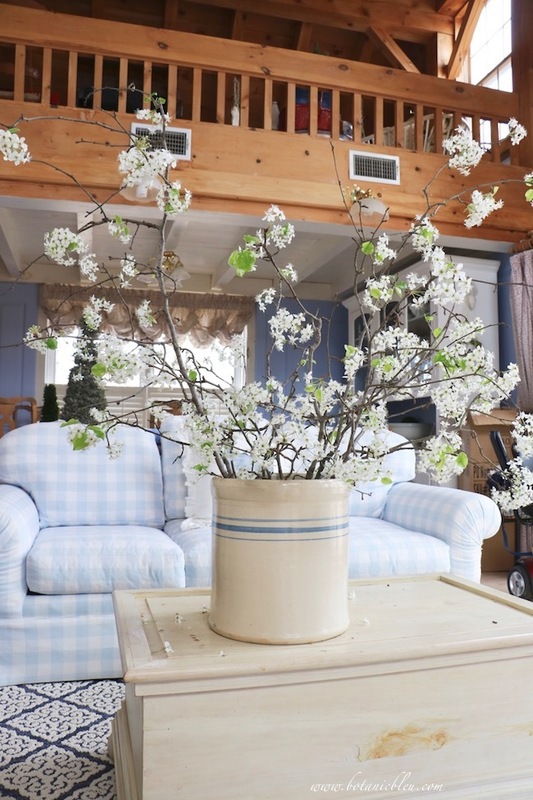 You will be rewarded with beautiful white flowers that last for several days. Today is Day 4 of the Christmas in Texas tour, hosted by Stacey at Poofing the Pillows. This week has been filled with an amazing variety of posts. The entire week's schedule is below. I hope you will visit the tour each day and leave a comment to let us know you dropped by. 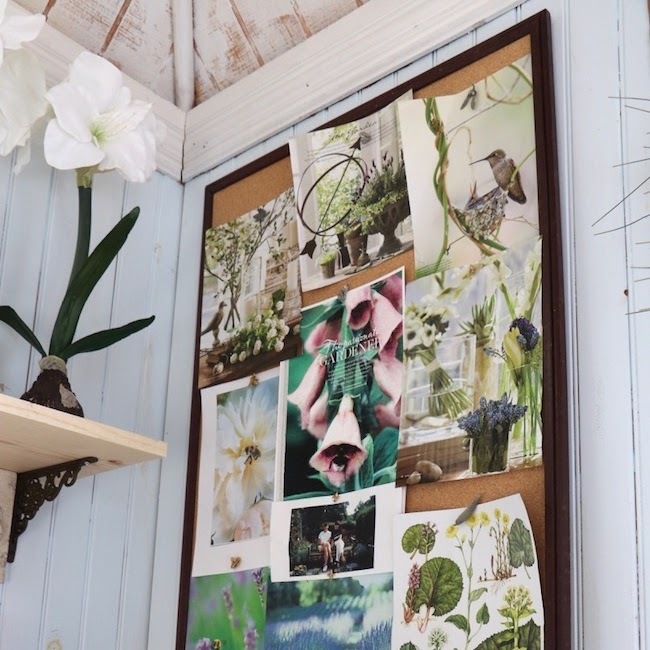 Think of comments as the 21st century version of calling cards. I think paperwhites are one of the most elegant flowers that grows. I've never forced bulbs before and would be afraid I would kill them, however, you make it sound so easy to do. 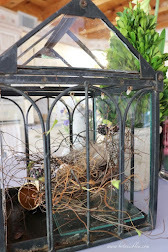 Maybe I can give this a go for next year...can't wait to see yours when they've bloomed! The paperwhites look so pretty in all your pretty dishes. You have the perfect spot for them. I love paperwhites and give off such a nice little fragrance! You have the perfect sunny spot. I have never tried to grow paperwhites. i think I need to give it a try. Oh Judith. before I am off to spay down a small tree with a cast of white, I am visiting the amazing beauty here with you....what makes this so awwww! Inspiring is that you have an abundance of paper whites in crocks. 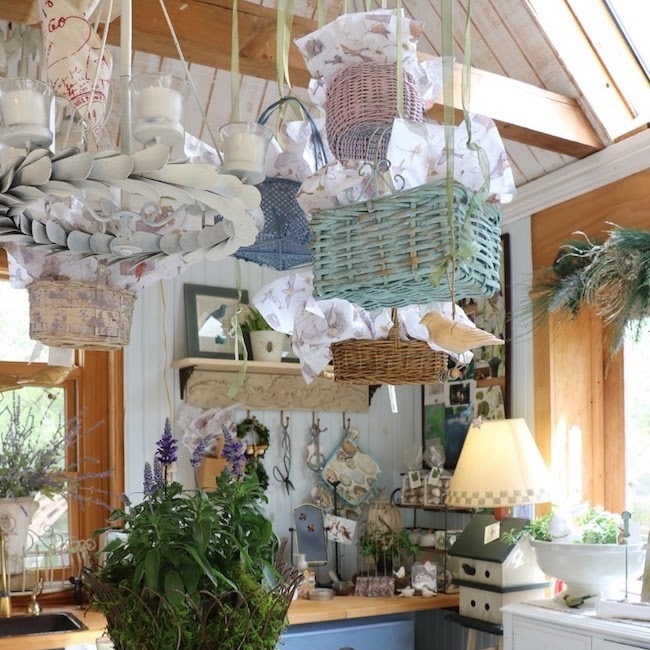 pots, cups, pottery that wow with amazing grace and beauty in there grouping window-side. What a winter wonderland of soon to be lots of whites magically grouped together. Looking forward to their blooming so. I love the look of paperwhites, but have never tried growing them. 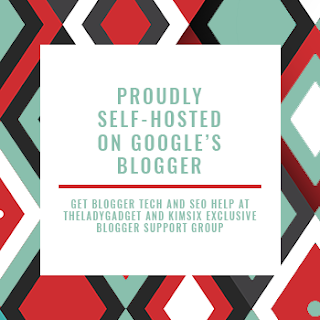 I will DEFINITELY refer to this post for green-thumb results! 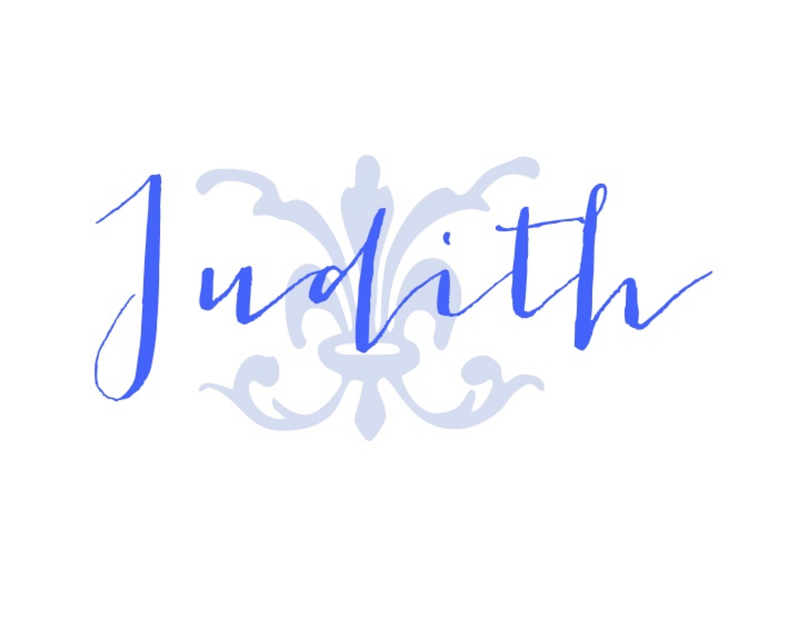 Thank you, Judith!